One-lung ventilation plays a pivotal role in thoracoscopic lung biopsy. However, it has the disadvantages of causing hypoxemia, tracheobronchial trauma and oxidative stress caused by the pulmonary reexpansion, which could be harmful to the postoperative course of interstitial lung disease. 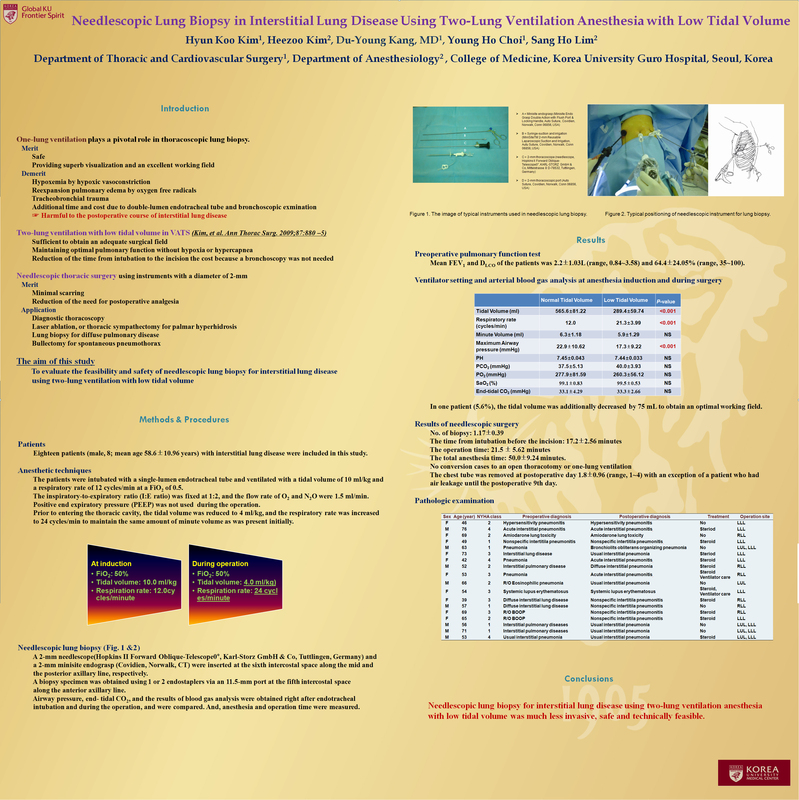 We performed needlescopic surgery for interstitial lung disease using two-lung ventilation with low tidal volume and evaluated the feasibility and safety of this procedure. Eighteen patients (male, 8; mean age 58.6+/-0.96 years) with interstitial lung disease were included in this study. The patients were intubated with a single-lumen endotracheal tube and ventilated with a tidal volume of 10 ml/kg and a respiratory rate of 12 cycles/min at a FiO2 of 0.5. Prior to entering the thoracic cavity, the tidal volume was reduced to 4 ml/kg, and the respiratory rate was increased to 24 cycles/min to maintain the same amount of minute volume as was present initially. A 2-mm needlescope and a 2-mm minisite endograsp were inserted at the sixth intercostal space along the mid and the posterior axillary line, respectively. A biopsy specimen was obtained using 1 or 2 endostaplers via an 11.5-mm port at the fifth intercostal space along the anterior axillary line. Airway pressure, end- tidal CO2, and the results of blood gas analysis were obtained right after endotracheal intubation and during the operation, and were compared. And, anesthesia and operation time were measured.